Rosewood's multi-purpose Pet Keeper tanks can be used to house smaller pets, including small fish or as holding tanks during cleaning and for transportation. Available in Medium (product code 568), Large and extra Large (product code 570) sizes, large is - 37 x 23 x 25cm with a volume of 12 Litres. 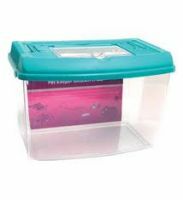 The clear part of the lid is hinged for easy access, whilst the entire lid can be removed when acces to the whole tank is required. The lids come in an assortment of contemporary and popular colours which cannot be guarenteed so please note the picture is a guide only as the lid may come in black, purple, grey or teal as shown.